Serving as a mentor brings many challenges and rewards, with the best mentors working to shape their mentees into other leaders, rather than just good followers. If done well, the long-term impact of mentoring can offer life- and career-changing benefits to both parties. The terms mentoring and coaching often get used interchangeably, which misleads the audience. While similar in their support of someone's development, they involve very different disciplines in practice. Mentoring consists of a long-term relationship focused on supporting the growth and development of the mentee. The mentor becomes a source of wisdom, teaching, and support, but not someone who observes and advises on specific actions or behavioral changes in daily work. Coaching typically involves a relationship of finite duration, with a focus on strengthening or eliminating specific behaviors in the here and now. Coaches help professionals correct behaviors that detract from their performance or strengthen those that support stronger performance around a given set of activities. Both mentoring and coaching offer incredibly valuable developmental support. However, one offers high-level guidance for long-term development, while the other helps provide a more immediate improvement in targeted areas. A character in Homer’s epic poem "The Odyssey" could be called the original mentor. When Odysseus, King of Ithaca went to fight in the Trojan War, he entrusted the care of his kingdom to Mentor. Mentor served as the teacher and overseer of Odysseus' son, Telemachus. The Merriam-Webster Online Dictionary defines a mentor as "a trusted counselor or guide." Other sources expand on that definition by suggesting that a mentor is someone who helps you with your career, specific work projects or general life advice out of the goodness of his or her heart. Why Seek Out a Mentor? Suppose a talented individual lands a sales job, and gains a senior sales executive as her mentor. The senior executive might guide her in her development as a leader, a strategist and a complete business professional. The mentor might not exactly instruct her or provide on-the-spot coaching or training. Instead, he will challenge her and encourage her to think through issues and approaches by asking difficult-to-answer questions and serve as a source of wisdom when needed. 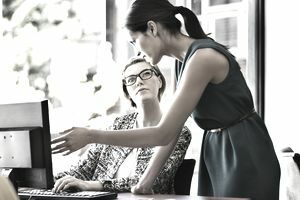 The relationship as mentor and mentee ends after the woman changes companies, but the senior executive's impact carries through in her work throughout the rest of her career. Many people attribute part of their professional growth to the guidance of a patient mentor who challenged them to think differently and open their eyes and mind to different perspectives. While each of us develops at our own pace, this type of influence can have many positive and lasting effects. A mentor becomes a personal advocate for you, not so much in the public setting, but rather in your work life. Many organizations recognize the power of effective mentoring and have established programs to help younger professionals identify and gain support from more experienced professional in this format. Takes a long-range view of your growth and development. Helps you see the destination but does not give you the detailed map to get there. Offers encouragement and cheerleading, but not "how to" advice. Serve as a coach as explained above. Function as an advocate of yours in the organizational environment such as your boss would; the relationship is more informal. Tell you how to do things. Support you on transactional, short-term problems. Serve as a counselor or therapist. When you first identify a mentor and establish a relationship, discuss and compare expectations for both the mentor and mentee roles with him or her. Clarify each person’s responsibilities and the process the two of you will use going forward to communicate, understand your career goals, follow through and problem-solve if needed. Make it your aim to maximize this experience so that you reap the full benefit while showing gratitude and respect to your mentor. Focus on being coachable and open to hearing feedback from your mentor whether or not it's positive. Don’t be afraid to ask for unvarnished advice or critiques. Practice your skills as a good listener, take what you can use and leave the rest. To provide structure for the relationship, specify up front some initial career goals you have, such as learning specific procedures or processes, or preparing for a promotion, for example. Discuss with your mentor how you can best measure the success and effectiveness of your working relationship together. Make it a point to schedule conversations with your mentor, and keep those appointments faithfully. As you commit to certain steps in your developmental progress or discuss taking educated risks to support the development of your career and move toward your goals, keep track of your discussions with your mentor and follow up specifically on those steps when you meet. Brainstorm for ways that you can help to drive and maintain your relationship with your mentor. While your mentor invests his or her time to help you, you must also participate and actively pursue learning. Investing your time in seeking out a mentor with whom you feel a natural fit. Sharing your goals and fears openly. Not expecting the mentor to solve your short-term problems or do the work for you. Sharing where you are struggling or failing. Listening carefully and then researching and applying the mentor's guidance. Showing that you value the mentor's support. Not abusing the relationship by expecting political support in the organization. A mentor can make a real difference in your career and life. Come to the relationship with realistic expectations about the role and a willingness to work hard. The impact of a mentor's guidance and wisdom now may not be felt for some years to come, but you will realize its positive impact over time and go on to become a mentor to others.